Ever agree to do something and then wonder “what the heck have I gotten myself in to?” Well, I did just that. My friend Connie asked if I’d contribute to her newest online class and, after a few back and forth e-mails of me saying “Connie, you have far more talented art journaling friends than I!” she finally convinced me I’d be great. So! My class is complete and I’ve sent it off to Connie to be included in the full class, and, just like Connie, I’m so stinkin’ excited! It wasn’t the teaching part that concerned me. Heck, I’ve been teaching for 20 years, and I know I truly am a gifted teacher. I feel confident in that. But having never had any formal art training myself, I really didn’t think I was a candidate to teach art techniques to adults. To kids, sure! But to grown women (and maybe even men), most of whom are probably artists themselves? This is a bridge I’ve never crossed. I’ve seen all those awesome videos artist/teachers create to demonstrate their techniques. And I have no clue how to make a video. I can “take” a video with my camera, but what to do with it after that? Clueless! So there are no videos in my little class. What there are, however, are tons of photographs and witty commentary demonstrating the techniques step-by-step. And the most awesome thing about it? It’s not just Kelly teaching the class; it’s Kelly, Sarah, and Olivia teaching the class together. 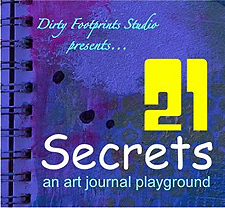 My contribution to the 21 Secrets Art Journal Playground is wrapped around creating art journals with your kids, using the things they say as prompts. My class is called “The Things They Say,” and the girls and I had a ball creating the samples we demonstrate in the class. Another awesome point about this class is Connie’s generosity towards the contributing artists. She’s set up an affiliate program to allow us to reap some financial rewards for our contributions. Each artist has a special link, so for me, click here and you’ll be taken to my personal registration page. The girls and I would love some of the Studio Mothers community to join us! Registration opened September 20, and the class itself starts October 1. Kelly, CONGRATULATIONS! Two talented people in their own right COMING TOGETHER-I truly ADORE good collaboration. I will definitely check it out. Thanks Robin! I’ve just been peeking in on the ning site Connie is setting up for the class, so I’m getting sneak peeks of all the classes! AWESOME! This is such an amazing group of women, and one man!, presenting a very diverse group of mini-workshops. I’m truly honored to be a part of it! Kelly, for the life of me I can’t imagine why you didn’t think you were qualified to teach an art class. You’re an amazing artist and have such a positive attitude about creating it that I can’t think of anyone better to learn the ropes from! Congratulations! It looks like a lot of fun! kelly, this seems perfect for you! congratulations!